Getting Started is Easy. Best of All, It’s Free. Now for a limited time, AWS customers can trial DgSecure risk free. That means you can detect and protect your sensitive data free of charge for 5 days. Click the button below to get started. Once you provide your contact information, we’ll get back to you with AWS credits and instructions on how to get started. to Secure Their Sensitive Data. Dataguise is the leader in Secure Business Execution, delivering data-centric security solutions that detect and protect an enterprise’s sensitive data, no matter where it lives or who needs to leverage it. For Amazon Web Services (AWS) customers, it offers industry-first support for sensitive data stored in Amazon Simple Storage Service (Amazon S3) and accessed via Amazon Elastic MapReduce (Amazon EMR) for all your big data use cases. We secure the sensitive data of some of the largest, industry-leading companies that are committed to being responsible data stewards. Pinpoint where sensitive data is across all repositories. Track how and where sensitive data is moving through a 360-degree dashboard. Q: DgSecure is free for the first 5 days, but will I get charged for compute? A: No. We’ll provide AWS credits. Q: What is the cost to run DgSecure after the free trial? A: $38/hour and billed monthly. You can cancel at anytime. Q: Doesn’t AWS offer security? A: Yes, AWS does offer security for you like perimeter, network, and physical security. 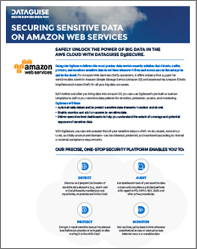 DgSecure is the only vendor that offers sensitive data security — detecting and protecting sensitive data contained within repositories you have running on AWS.